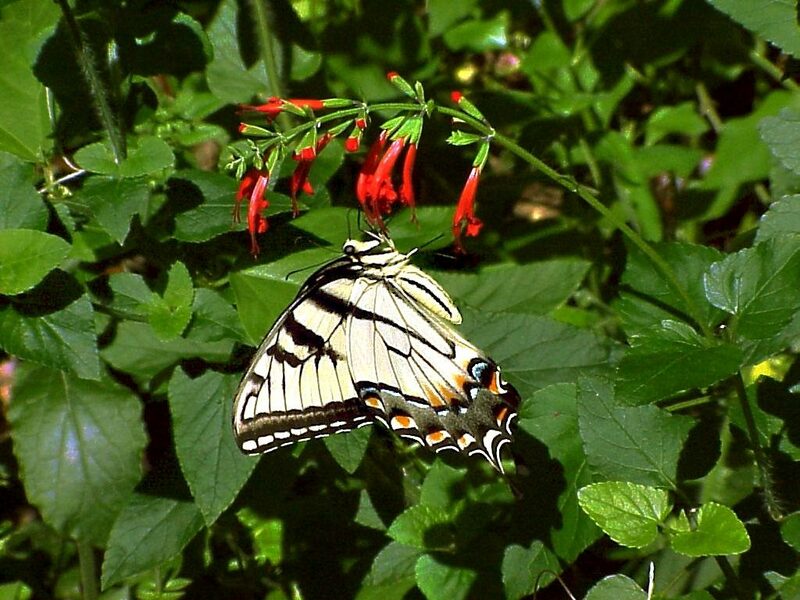 The eastern tiger swallowtail, Papilio glaucus, is in the Papilionidae family. It can be seen soaring high in the tree-tops along forest borders and streams in search of the tender new leaves of a variety of trees that is uses for larval food. It is a strong flier, at times flying rapidly, at others quite slowly. The males may be found congregating at mud puddles or the moist banks of streams. Adults are most active from February to November. 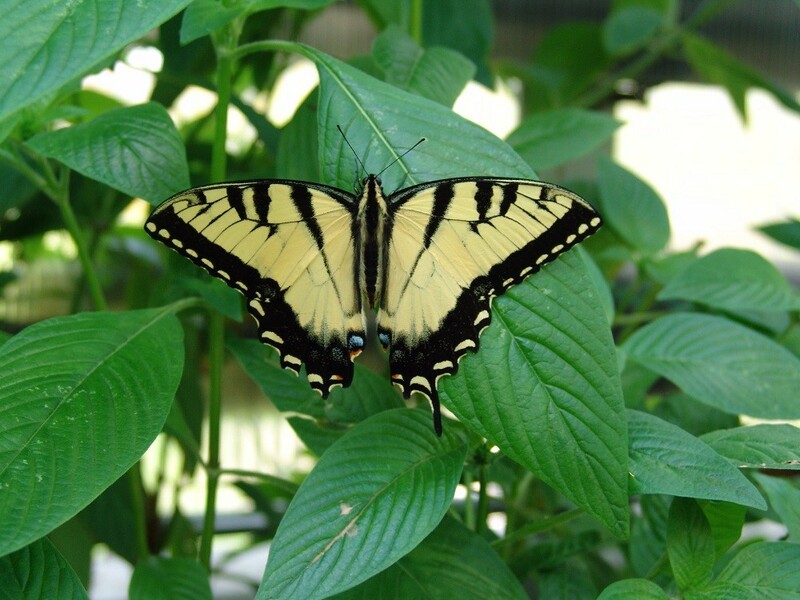 Its wings are yellow with three black vertical stripes, a black border, and tails. The lower wings have a row of blue and red dots on the outer edge. The body is usually yellow, except for the black morph form, and has a black stripe along it. They range in size from 3 ½ to 4 ¾ inches. The females of this butterfly have two color forms, the traditional yellow and black and a very dark brown that makes the ‘tiger’ stripes barely visible, and sometimes not visible at all. 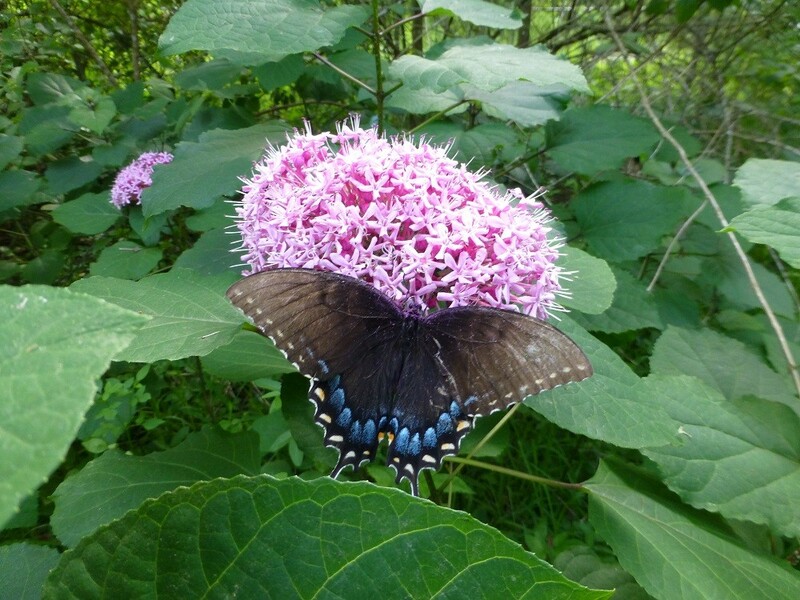 It is thought that these females are attempting to mimic pipevine swallowtails which are distasteful to predators. Some of the tiger’s preferred nectar plants are buttonbush (Cephalanthus occidentalis), red salvia (Salvia coccinea), Spanish needles (Bidens alba) red pentas, and lantana. You can purchase Mexican hydrangea starter plants here. The eggs are laid singly and are yellow-green in color. The larva, or caterpillar, resembles a bird dropping when very young, but once more mature they become dark green. The front end of the caterpillar is rather swollen looking and has a pair of eyespots with black pupils. Just behind the eyespots are four purple dots running down the length of the body. During the day the caterpillar hides inside of a curled up leaf that it formed by drawing the edges of the leaf together with silk. The larvae generally feed at night. The caterpillar is roughly two inches in length at maturity. The chrysalis is generally 1¼ inches in length, bumpy, pointed at each end, with the front end sporting a small pair of horns. The chrysalis is attached to a branch or twig vertically with a silken thread around the midsection. If the caterpillar pupates late in the year it will over-winter inside of its chrysalis and not emerge until spring. The winter chrysalis is brown mottled with dark brown and the summer chrysalis is mottled green. In Florida there are usually three broods, the first brood being the emerging butterfly from the overwintering chrysalis. You can buy red salvia seeds here.